American brewers have been inspired to recreate every style and sub-style of beer brewed anywhere in the world in their own breweries and backyards. Of the hundreds of styles defined for brewing competitions saison evades classification most effectively. Ascribing a precise definition to it is impossible, but they are united by their yeast-driven, phenolic flavors and high attenuation. Practically any wort properly fermented with a saison yeast strain, could justifiably be called a saison. Saisons cover the gamut from refreshing-straw-colored-quenchers to dark-complex-vinous-sippers. The romance of saison is that it offers the creative brewer diverse seasonal and localized variation, harking back to the time when these beers were an agricultural product of farm-life tied to the harvest. While saisons do not always feature sour or funky flavor, the best ones from both America and their native Belgium often do. Much of the current fervor is traced directly to 2004 when Phil Markowski’s informative Farmhouse Ales: Culture and Craftsmanship in the Belgian Tradition (Brewers Publications, 2004) was published. It is hard to imagine any creative brewer reading De Baets’ inspiring 30 page chapter on the history of saison without their head spinning with ideas – the book that launched a thousand saisons. An elementary recipe inspired by Saison Dupont, the archetype of the style, could be comprised of only water, Pilsner malt, and Saaz hops, but many American brewers opt for something more complicated. Saisons were originally refreshing beers brewed for summer consumption on the farm (the original lawnmower beer), but these days it is rare to see a commercial example under 6% ABV. Even if you are aiming for a strong beer, be mindful of pushing original gravity too high; with the high degree of attenuation 1.050 (12.4°P) wort can result in a 6.5% ABV beer. Pilsner malt is the most common saison base malt because of the clean, crisp malt character it provides. The best practice with a recipe high in Pilsner malt is to boil the wort for at least 90 minutes to volatilize DMS. Many brewers choose domestic pale malt to reduce cost, and it makes a good substitute especially in darker saisons. Vienna or Munich malt is sometimes added to provide a bready flavor and golden hue. As a nod to saison’s agricultural past, many breweries include malted or unmalted grains in addition to barley. Wheat is especially popular, but rye has also gained considerable acclaim in beers like the Bruery's Saison Rue, and McKenzie Brew House's Saison Vautour. Rye malt imparts both a telltale grainy flavor and protein, which adds body without sweetness. Specialty malts are relatively rare in classic pale saisons, especially caramel/crystal malts which sweeten the classic dry finish. When they are included in the grist of even hearty saisons, keep them to a minimum. For dark grains, dehusked malts like Weyermann Carafa Special and debittered black malt are ideal. The dry finish of saisons accentuates aggressive malt flavors, so excessive amounts of roasted barley or black patent can result in a harsh character. If you want the coffee and chocolate flavors of these grains, try a cold extraction to minimize their acrid bite. A single-step infusion mash is usually adequate, but undermodified base malts may benefit from a protein rest. The saccharification rest is usually performed below 150°F (66°C), sometimes as low as 142°F (61°C) as in the case of Pretty Things’ Jack D'Or, to ensure the requisite high level of attenuation. If you opt for a cool conversion temperature, you may need to extend the rest longer than the standard 60 minutes because beta amylase does not work as quickly as alpha amylase, which is more active at temperatures in the 150s°F (67-71°C). If you include a large portion of unmalted grain, conversion will take even longer. Remember that while a positive iodine test indicates the presence of starch, a negative test does not preclude the presence of excessive unfermentable dextrins. As insurance, some brewers employ two starch conversion rests, one in the low-mid 140s°F (61-63°C) followed by another in the mid-high 150s°F (68-72°C). If you are brewing a high alcohol saison it is beneficial to get a portion of your fermentables from kettle sugars. The neutral character of table sugar is an economical choice if your only goal is to ensure a dry beer. More flavorful options like honey, unrefined sugar, candi syrup, and even dried fruit, are good choices if you want to impart additional flavors. If malt extract provides most of the gravity, then sugar should contribute at least 10% of the fermentables, even in moderate gravity versions. Saisons are hopped with a wide variety of strategies from subtle to assertive. Early boil hop additions are generally moderate because the lack of residual sweetness accentuates bitterness. A small addition of hops late in the boil for aroma is common. Many American brewers are foregoing the traditional European hops in favor of brighter citrusy varieties from American and New Zealand, which complement the spicy qualities of the yeast. Dry hopping is a good choice for saison because it contributes aromatics without increasing bitterness. There are several saisons that are so hoppy that they could easily pass for West Coast IPAs, such as Willimantic Brewing Co.’s Dyvil Hopyard Double IPA and Cabinet Artisanal Brewhouse’s Freshop Saison. However, unlike a standard IPA, even after the hops fade the yeast aromatics remain giving the beers a second life. Saison is a style primarily defined by its yeast, so when planning a recipe, yeast selection is paramount. The common traits that all saison strains share are the production of more spicy and peppery phenols than fruity esters, a high degree of attenuation, and a preference for elevated fermentation temperatures. Despite their high attenuation many saison strains do not leave an overly thin beer thanks to high glycerol production (making them a good pairing with Brettanomyces, which does not exhibit strong glycerol production). These strains do not need to be stressed; aerate and then pitch as many cells as you would for any other beer to avoid excess ester and fusel alcohol production. The Saison Dupont strain is available from both Wyeast (Belgian Saison - WY3724) and White Labs (Belgian Saison I - WLP565). Dupont is the saison yeast that all other strains are measured against. At temperatures from the mid-80s°F (30°C) into the low-90s°F (32-33°C) it produces a spicy blend of pepper, yeast, and fruit without noticeable fusel alcohol production. Patience is required because the yeast can take several weeks to attenuate a beer completely even at these elevated temperatures; at lower temperatures fermentation often stalls with considerable gravity remaining. Bob Sylvester started fermenting his beers at St. Somewhere with a pure culture of WLP565, but experienced sluggish attenuation. However, as he explains it “[The yeast] took several generations to acclimate to the brewery environment. The first few batches took a couple of weeks to fully attenuate. We now reach full attenuation, typically down to almost zero, in three days. Seventy some odd generations later, along with whatever wild yeast picked-up from the air, I am convinced, what is now our house yeast, could ferment water. I pitch at a much higher temperature than normal, 80°F (27°C), and let it rise as it will to 90°F (32°C) or so.” He swears by the character he achieves from open fermentation in flat-bottomed wine fermentors. White Labs produces another strain, Belgian Saison II (WLP566) that is rumored to be a different isolate from Brasserie Dupont. WLP566 has a similar character to WLP565 (although it tends to be slightly fruitier), but is less finicky to work with. This strain, rumored to originate from Brasserie Thiriez, is available from Wyeast as WY3711. It produces fully attenuated beer, with a mild pepper character and more tropical fruit than other saison strains. It has gained many devotees in the U.S. because it is less temperamental than the Dupont strain. While the character of the finished beer benefits from fermentation temperatures in the low 90s°F (32-33°C), the strain will attenuate completely at temperatures as cool as the mid-60s°F (18°C). Despite rarely finishing above 1.004 it leaves an impression of body. French Saison is also an ideal strain for extract brewers who do not have as much control over the fermentability of their wort. Like many brewers, Alex Ganum the founder of Upright Brewing, liked the flavors produced by this strain. “We use the Wyeast 3711 which I love for the fact that it produces lots of different flavors in the different worts we put it in which makes it easy for our beers to be distinct among themselves. Lots of people would probably say that they love how well it attenuates although I consider it over-attenuating and we often struggle to get the yeast to just quit at some point. It makes bottle conditioning a bit of a pain as you could imagine.” Ganum has since switched yeast a couple of times. First to an isolate from a bottle from De Ranke, and then to Wyeast 3522 Belgian Ardennes a strain he finds performs well with their open tanks and the moderate Pacific Northwest climate. Jeff Stuffings of Jester King Craft Brewery finds BSI's French Saison strain, which serves as their house strain, to be slightly different than Wyeast’s version, despite the same source. After brewing a version of Le Petit Prince (Jester King’s 2.9% ABV table saison) at Brasserie Thiriez with the brewery’s actual house culture, he found that it was a bit cleaner with more pepper and less fruit than the French saison strains available from American yeast labs. Though not from the same source, White Labs Saison III (WLP585) produces some similar tropical fruit notes, a slight tartness, and is easy to work. While it dries out the beer adequately, not overly so like WY3711. I typically see about 90% apparent attenuation with this strain. For homebrewers this strain from Wyeast (WY3725) is only available at certain times of the year as a seasonal release. It ferments well from the mid-60s°F (18°C) into the high-80s°F (31°C) and is highly attenuative, even in worts with specialty malts. Despite the name, it is rumored to have been isolated from Fantôme. WY3725 produces a relatively clean character compared to most other saison strains at the lower end of the temperature range. Allowed to ferment warmer the flavor becomes considerably fruitier. WY3725 is easy to work with and performs well in stronger beers with assertive flavors, complementing spices especially well. This other seasonal release (WY3726) is a close cousin to the Dupont strain, with a supposed origin at Brasserie de Blaugies. Swapping the tropical fruity notes of French Saison or Saison II for heavier banana, it provides a classic dry peppery saison character, and is again easier to work with than Dupont. First released in 2012, this was the first dried version of a saison yeast onto the market. It is a highly attenuative strain, creating a dry beer in a relatively short period of time. The flavor however, lacks the earthiness and spice of the best liquid strains. Belle Saison is also a prodigious sulfur producer, so extended conditioning may be necessary. 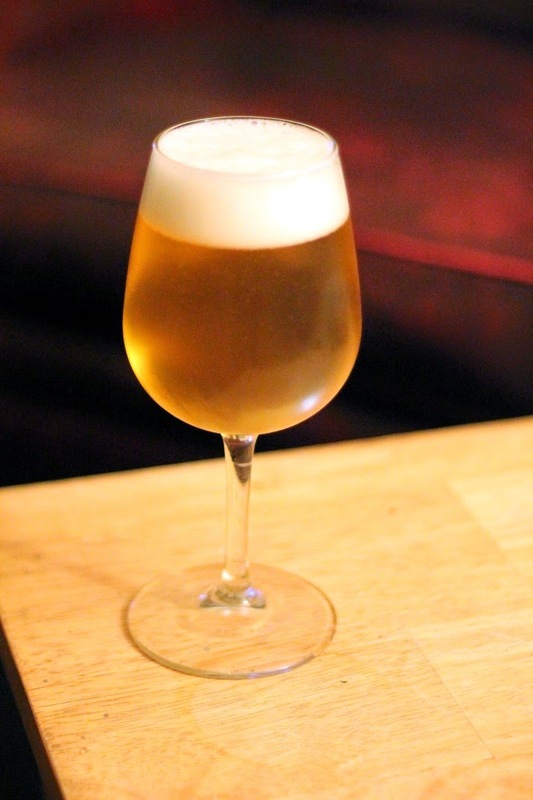 White Labs produces Saison Ale Yeast Blend (WLP568), which retains some of the character of their Belgian Saison strain while increasing the rate of attenuation. However, if you have problems getting the Dupont strain to perform I have achieved more saison-like results by blending it with a more attenuative saison strain rather than a standard Belgian ale yeast. In 2011 White Labs released American Farmhouse Blend (WLP670), which contains Brettanomyces from The Lost Abbey in addition to a saison strain. The blend is easy to work with and creates a combination of rustic Brettanomyces funk, and peppery yeast. East Coast Yeast produces two saison blends: Saison Brasserie (ECY08), a blend of several saison strains which works quickly and gives a nice spicy character, and Farmhouse Brett (ECY03) which has the same blend of saison strains with the addition of a strain of Brettanomyces isolated from Fantôme. When I used an early version of ECY08 I found it to be banana-heavy when young, but after mentioning this to Al Buck he removed the responsible isoamyl-acetate producing strain. I've also had promising results with the first batch I fermented with The Yeast Bay's Saison Blend. It did a fine job drying the beer out, and produced enough peppery character to cut through an aggressive hop schedule without muddling it. Some breweries blend in their neutral house ale yeast to assist with attenuation, but concerns are possible about the flavors that strain will produce when exposed to the high fermentation temperature preferred by the saison strain. If you lower the temperature you are further reducing the attenuation and flavor contribution of what should be the primary strain, reducing the most prominent character of a saison. While many breweries allow their saison fermentation temperatures to rise close to body-temperature, this may not be ideal for homebrewers. The pressure created by large volume cylindro-conical fermentors at commercial breweries suppresses ester production. I have had the best results from pitching near the low end of strains’ suggested temperature ranges, allowing the fermentations to warm slowly as the yeast works. 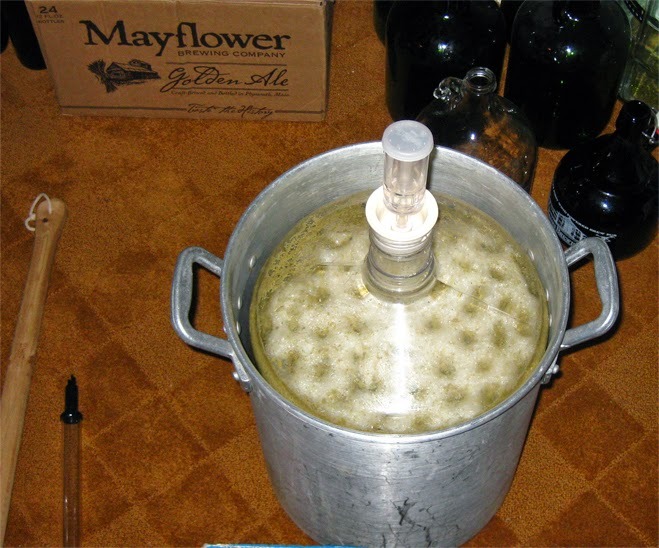 Many homebrewers who lack fermentation temperature control brew saisons in the summer when they are unable to brew with yeasts that require lower temperatures. 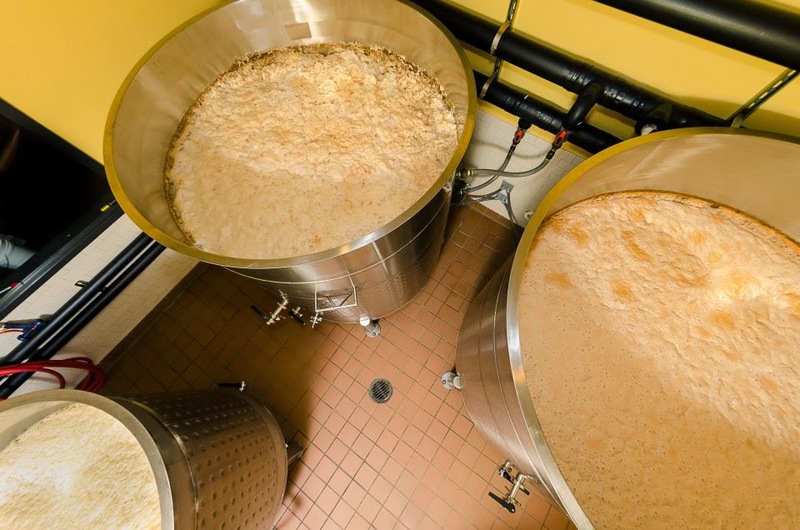 This approach is risky because sudden temperature drops can cause the yeast to stall before fermentation is complete, and temperature spikes can result in the production of hot fusel alcohols or even kill the yeast if the temperature rises too high. Homebrewers relying on the ambient temperature to heat the fermentation should try to find a location that has a relatively stable temperature about 5-7°F (3-4°C) degrees below your target fermentation temperature; the exothermic yeast activity will heat the fermenting beer the rest of the way. Placing the fermentor in a large bucket of water will insulate it from the daily cycle of temperature changes. If the temperature is too cold for the yeast, heat the fermentor with a Brew Belt, or place the fermentor in a water bath with an aquarium heater or in an insulated box with a ceramic reptile heater. The easiest way to regulate the temperature with these methods is to attach a temperature controller (like the ones many homebrewers use for their kegerators) that has a heating mode. Terry Hawbaker, while brewing at Cabinet Artisanal, turned to a saison yeast strain (Wyeast 3711) to allow him to use fermentors whose glycol cooling jackets did not function. This takes a great deal of skill because as the temperature climbs unconstrained the yeast becomes even more active and will push the temperature higher still. The Philadelphia-area-based McKenzie Brew House has commanded gold in French- and Belgian-Style Saison an astounding three out of the previous four years at the Great American Beer Festival® for their Saison Vautour. Remarkably each of the three wins came with a different treatment of the same base recipe: first clean fermented in stainless steel in 2007, followed by “accidentally on purpose” Brettanomyces spiked by their bottling equipment in 2009, and most recently wine barrel fermented with a mixed-microbe culture in 2010. Sadly with the exit of their brewing duo, Ryan Michaels and Gerard Olson, it remains to be seen what direction the brewery will take. Their funky saisons were fermented with White Labs WLP566 (Belgian Saison II) for two to three days in a conical tank. Once active fermentation peaked, the portion of the beer to be soured was pumped into barrels which had been colonized by a variety of strains of wild yeast and bacteria. For the most part the source of these strains was bottle dregs from their favorite sour beers, which were added directly to the barrels without additional culturing. One of the highest complements I have been paid by a brewer was having Michaels pour the dregs from the second vintage of our dark saison into one of his barrels. Pulling samples from the different barrels with the same unsanitized thief also spreads those microbes from one barrel to the next. When Nathan Zeender and I brewed a collaboration with them, we settled on a beer that would bridge the Belgo-French farmhouse traditions we named Irma Extra, a saison-bière de garde-bière de miel mashup fermented and aged in oak. The aim was to craft a beer that would offer a broad palette of elements that could be pieced back together after the beers had ripened separately. A single wort was split to produce four distinct variants: a clean version in stainless steel (Irma), a funky version in a red wine barrel, a miel version in a red wine barrel with a blend of honeys added directly to the barrel to preserve their aromatics, and a version in an apple brandy barrel to accentuate the classic caramel apple character indicative of bière de garde. While most of the stainless steel fermented portion was served on tap without being soured, it was also available for blending to soften the barrel-aged beer. The base beers for most of the McKenzie Brew House sour beers are also served clean, which means that neither the recipe nor primary fermentation can be tailored. It also leads to the creation of beers that they might not have set out to brew otherwise, like a sour Baltic porter (Oer Faute). Their dry-hopped Tristessa is one of the better hoppy funky beers I have tried it was created by adding several hops socks to the barrel for the last few weeks of aging. Their Grisette (a close cousin of saison) is reminiscent of historic saison, a delectable session ale with enough sourness to enhance its refreshing wheaty flavor. Beers age until they taste ready, which is rarely fewer than three months. It is an admittedly unscientific method, but the results are often stunning. 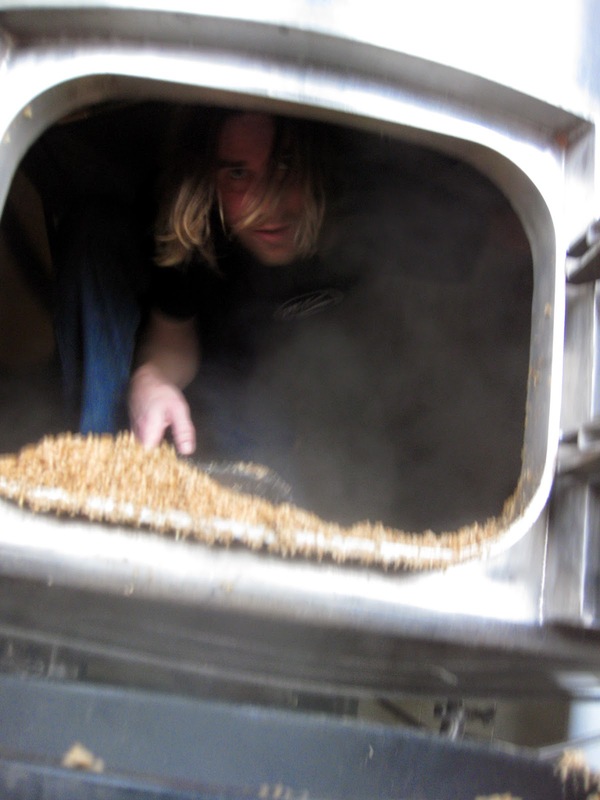 Assistant brewer Gerard Olson would occasionally collect extra wort in a carboy to inoculate with dregs. This starter served as a good source of microbes for repitching beers at bottling or kegging. All beers are naturally carbonated and hand bottled for sale at the three McKenzie Brew Houses. When you are only doing small bottling runs for direct sales you do not have to worry about achieving the same level of consistency as a brewery that distributes. Irma Extra turned out to be a wonderfully complex saison with big notes of apple and berry, and a pleasant lactic sourness. As it warms a bit of oak comes out, but it maintains a highly drinkable balance. Olson has since gone on to open Forest & Main Brewing Company in Ambler, PA. It is a small brewpub housed in a renovated 19th century house just outside of Philadelphia where he brews a half dozen saisons including several traditional farmhouse versions close to 4% ABV, while his partner Daniel Endicott focuses on authentic English cask ales. I've been as impressed with the beers he has brewed there as I ever was with those at McKenzie. Great synopsis. I look forward to picking up a copy of your book and eventually Farmhouse Ales. I have had the same experience with the Belle Saison yeast- it just doesn't have the same bold flavor you need in a beer so dependent on the yeast. The WLP566 Belgian Saison II is great stuff though! I can't wait for my copy of your book to arrive, literally a mind field of knowledge and inspiration. Amazing work, we all raise our glasses to you, cheers. Great writeup! I know you wrote this for the book, but it's already a bit dated, in that the Yeast Bay has released their saison strains (the Saison/Brett blend is absolutely amazing, same goes for Wallonian Farmhouse - haven't tried the Saison Blend yet). Have you tried mangrove jacks M27 belgian ale yeast? Just curious as to what your take on it would be. Any advice on water? Cheers! I haven't used any of the Mangrove Jack's strains yet. Some strains marketed as generic "Belgian Ale" strains work well in saisons, but many are too fruity and not attenuative enough. I don't think that much bicarbonate would benefit a light, crisp, pale beer in the classic saison model. I'd suggest starting with filtered tap water. If you taste a character you like or dislike, adjust your water to suit your recipe and tastes. I don't usually adjust much for my saisons, but sometimes I'll dilute with distilled water to reduce the carbonate, and up the sulfate and/or chloride depending on the balance I'm hoping to achieve. Would you recommend pitching on top of the previous yeast cake or collecting a smaller amounts of the yeast to create a "house strain" as a homebrewer? Will I lose any of the classic Saison phenols by over-pitching and using the entire yeast cake? I'm starting with WLP 565. This was an amazing write up and really gave a lot of insight into all of the different yeasts. Thank you! I think it's always a good idea to pitch a measured amount of yeast rather than an entire yeast cake. Try pitching more or less to see what produces the best results with your strain for your palate! Aeration, pitching temperature, fermentation temperature profile etc. are all worth investigating as well. Really great article Mike, I love the behind the scenes info youve been able to gather over the years from McKenzie's. Ive applied it all to my Saison brewing over the years and its been great. Forrest and Main are doing great barrel aged Saisons, Gerrad Olson spoke at my home brew club a while back and I was able to pick his brain for a while and chat Saison. Great guys and knowledgeable brewer. Shame you didn't get to Mention The Yeast Bay's Wallonian Farmhouse, maybe you havent gotten to it yet but I have fallen in love with the strain. Very easy to use and uniquely characterful. My own review of it is below. Great review! I´m thinking about using the Bele Saison dry yeast and some Brett on secondary, and how it is written "The flavor however, lacks the earthiness and spice of the best liquid strains". Even using the Brett, this diference in flavor profile would be detected in the beer? Brett will alter both the esters and phenols produced by the primary yeast, so certainly worth a shot using Belle Saison in a mixed-fermentation! Honestly I only used the dry strain once, and tasted it in a few homebrews, could just be that none of them used the "right" combination of pitching rate, aeration, and fermentation temperature. I am making a saison using pilsner, and a little oat and wheat for some body, then motueka (sp?) in boil and French Saison yeast. Should I dry hop and use something else to get the correct IBU? I've got a funky saison fermenting (with te yeast from this one plus Lacto), bittered with Rakau and aroma hopped with Motueka and Nelson Sauvin. I plan to dry hop, but I'm looking for a big hop nose. SO it depends on what you are looking for. You can taste it after fermentation and decide from there. Same for the IBUs, no advantage to great aroma hops early in the boil, but no harm in it either. I am hop bursting, so hopefully that equals things out. Great article. I truly enjoy reading your stuff, especially your book is a true gold mine. I was wondering if you know where the saison yeast part of the WLP670 is from? I've brewed with the 670 and the 566 and i think that the latter is too upfront with spicyness and cloves. The 670 is much more subdued "saisony"
I'm planning a "sour" saison in the likes of Hill Farmstead's Anna, Clara or Arthur, which all have a slight tang and is not overly phenolic, clovy and so forth. Could I pitch with both the 670 and dregs from a HF saison and get a similar tartness? The other route i'm considering is to get a saison yeast like 670 without the Lost Abbey brett and add either dregs or a mix of brett and Lactobacillus. I think WLP670 plus dregs would be a great combination. Not sure what the brewer's yeast strain in the blend in, Tastes like it could be Saison II, but that is just a guess. Good luck! I like the Belgian Saison from Wyeast pitched at 90 and raised to 100F over 7-10 days then cool slightly to 85F and add a pack of Belle Saison to complete the fermentation. The Wyeast stalls for me at 1.024-1.032. You get a dry, flavorful beer this way. I've just brewed my first all grain Saison using Mangrove Jack's M27 Belgian Ale yeast. OG was 1052 and down to 1002 in just 4 days. Mind you, I pitched at 28 degrees and wrapped fermenter in a blanket. Exothermic heat has kept fermenter warm. Great article BTW. Great article! Have you tried the Wallonian Farmhouse strain from The Yeast Bay? Looks interesting, but I can't seem to find any reviews on it. I've had great results with The Yeast Bay's Saison Blend, but haven't used the Wallonian Farmhouse strain (despite the fact that Nick sent me some pre-release in 2013). Interesting - I notice you suggest fermenting WL565 at 30 degrees+, however on the pack I just pitched, and on the WL website, they recommend optimal fermentation at 21-24 degrees C.
I recently used WLP 515 - Antwerp Ale to ferment a batch of biere de garde style ale, and I think that while it's maybe a little unconventional it works quite well! Quite clean and neutral but with a hint of Belgian character. Edvin - I have a friend that makes magnificent wild and farmhouse ales who loves the Wallonian blend. I have a vial I'll be using this month sometime. hi!I've read in the post and in a comment that you got great results with saison blend by the yeast bay. Can you describe me flavor and aroma profile, please? Reading the description in yeast bay website, this yeast seems to be similar to dupont's yeast. Is it right or are they different? I've enjoyed it, but only as a house culture I've added Brett too... young it certainly has similarities to Dupont, although maybe even a bit brighter (might just be the Sacch Trois I added). As it ages the Brett quickly takes over though. Hey Mike! 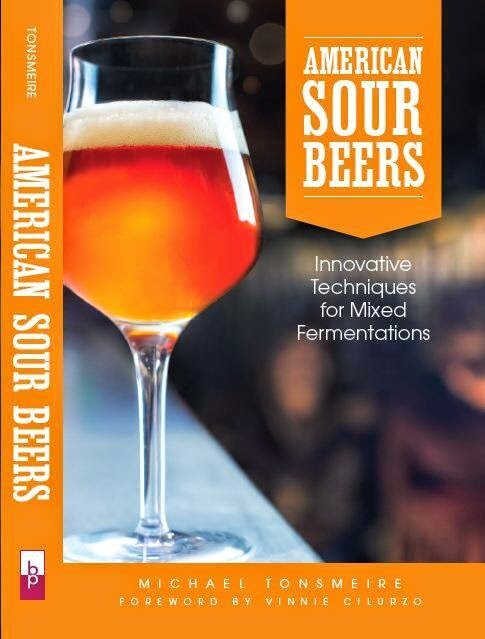 I'm taking your advice from Chapter 2 of "American Sour Beers" and am planning my first brew, but of course I read ahead and am probably overanalyzing... But I could use your help in prepping for my first sour beer. I've been brewing different iterations of a saison for several years that my friends love, and that won 1st place in a small saison competition last year. I adjusted the recipe down in terms of gravity and IBU to the suggested range, but I'm concerned the Wyeast 3711 I use will dry it out too much. Will mashing at a high temp (159°) and adding unmalted grains leave enough dextrins for the microbes to work with? Should I pick a different (high floccing/lower attenuating) strain? Should I build a new recipe? I also haven't picked out a souring microbe blend just yet so would appreciate any suggestions! Thank you for inspiring me to try my hand at brewing sours! It depends what sort of character you want in the finished beer. If you are only looking for Brett funk, a low gravity after primary is totally acceptable. In fact, I like to dry out a saison and then pitch Brett at bottling. That way you can enjoy the beer as the Brett works without worry of over-carbonation. If you want sourness though, best to select a strain that isn't capable of fermenting dextrins. There isn't much that can stop 3711. Perhaps the Dupont strain, which is finicky. You could cool it when it gets close to 1.020. Bottle dregs are my favorite, especially now that there are so many wonderful local sours available. Otherwise it depends on what you are looking for. Yeast Bay Melange would be nice in a saison, mild acidity, complimentary funk. Wyeast Roeselare is reliable. Happy to give more details if you let me know what character you like! Thanks for your help! I definitely want more than just Brett funk (and am prepared to wait!). I plan on racking onto oak chips for secondary fermentation. I'm looking for moderate to intense sourness, some funk, but while still retaining a little of the fruity and/or peppery Saison notes if possible. Oak character is always a plus. Your suggestion of cold crashing before the Sacch finishes to leave some sugars for the microbes seems like a good idea too. I also considered using a Saison grist bill but fermenting with a high floccing/low attenuating English Ale strain as it should leave plenty of dextrins - is this a thing? I think it would lead to a very sour beer but may not develop the complexity that I like in Saisons. From what I understand, you recommend pitching the Sacch strain and a microbe blend together at the beginning of fermentation, correct? I also have been collecting various bottles with usable dregs that I can pitch. When you pitch Brett, pretty quickly the classic saison flavors will go away. Your best bet may be to make two separate beers, an aged sour and a fresh saison. Then blend to taste and consume quickly? That way you'll have some acid/funk with the fresh saison pepper and fruit. I do like pitching together, but then cold crashing may not be ideal. English yeast won't give you the saison character you were hoping for, obviously. What is your take on WLP565? It seems to be a lower-attenuating strain. I'm thinking of pitching WLP565 along with Melange and bottle dregs, or just doing Roeselare (and no clean strain) with bottle dregs. I really enjoy Flanders Reds and Oud Bruins so maybe that's the way to go. Is there anything that can be done to boost Saison character, like raising the temperature during primary fermentation? In the end I'm going for something sour and funky over Saison-y, but could certainly brew a clean one to blend in as you suggested if necessary. I'm excited to get this thing started! Thanks again so much for your input. The classic Dupont strain is finicky. With the right wort and fermentation regimen it can ferment dry. It needs heat and time to do that. It also seems to really improve with repitches as it acclimates to the brewery. Warmer will also boost ester production, which could be good or bad depending on the strain and desired results. Light spicing is also an option if there is a particular character you want to accentuate. Цитата: "Пивные дрожжи размножаются только почкованием и делятся примерно трижды в неделю, следовательно, за год сменяется примерно 150 поколений..."
Вы считали поколения или повторное количество повторных сбраживаний одного штамма? Вы расчищали сброженный дрожжевой осадок в чашках Петри? Я свои дикие дрожжи расчистил, колонией одной клетки засеял 5 литров сусла. Латентная фаза - 5-6 суток, затем активное брожение. С искренним Уважением и надеждой на понимание. Quote: "Brewer's yeast breeds only by budding and is divided about three times a week, therefore, about 150 generations are replaced in a year ..."
Have you considered generations or repeated amounts of repeated digestion of one strain? Have you cleared the fermented yeast sediment in petri dishes? I cleared my wild yeast; I sowed 5 liters of wort with a colony of one cell. Latent phase - 5-6 days, then active fermentation. Do not seek for "language". With sincere Respect and hope for understanding. I'm not sure what techniques St Somewhere uses for their yeast propagation and purification. With my house saison culture I repitch without streaking it out on plates as it is a combination of brewer's and wild strains. Yeast also mutate naturally over generations. If one cell develops a mutation beneficial to the situation its offspring can quickly come to dominate a culture. That may be what happens over those generations too.